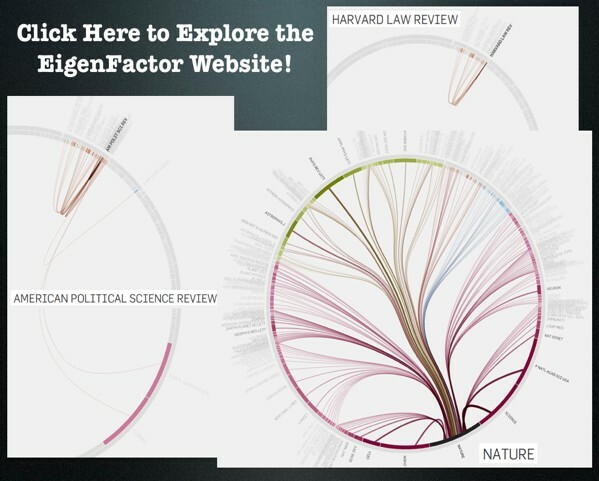 Given our interest in both interdisciplinary scholarship and the spread of ideas, we wanted to highlight one of our favorite projects–eigenfactor.org. Here is basic documentation from their website. There are also links to academic papers offering far more detailed documentation for the data and algorithm choice. 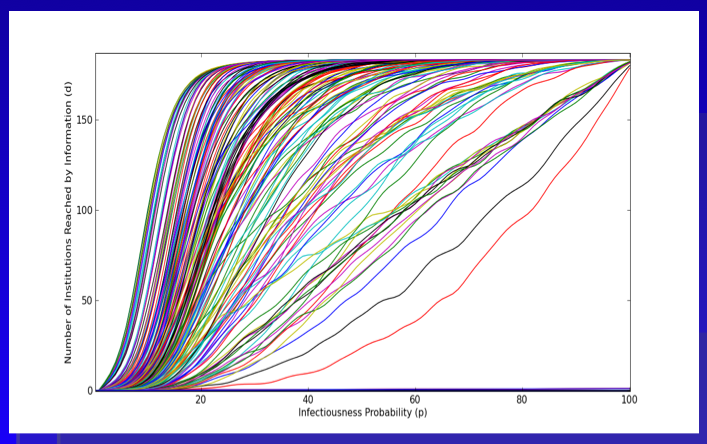 In particular, read Martin Rosvall and Carl T. Bergstrom, Maps of Random Walks on Complex Networks, Proc. of the Nat. Academy of Sci. 105:1118-1123 (2007). The above visualizations are written in Flare by Moritz Stefaner. Click on the slide above to reach these interactive visualizations. 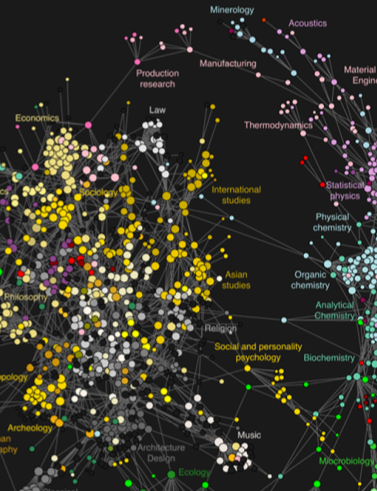 These mapping offer reveal the reach of various publications across disciplines–some are insular and others have incredible reach. The inner rings are journals and the outer rings are the host disciplines. Enjoy! As reported in a wide variety of news outlets, last week, a large amount of data was hacked from the Climate Research Unit at the University of East Anglia. This data included both source code for the CRU climate models, as well as emails from the individuals involved with the group. For those interested in background information, you can read the NY Times coverage here and here. Read the Wall Street Journal here. Read the Telegraph here. For those interested in searching the emails, the NY Times directs the end user to http://www.eastangliaemails.com/. Given the data is widely available on the internet, we thought it would be interesting to analyze the network of contacts found within these leaked emails. Similar analysis has been offered for large datasets such as the famous Enron email data set. While there may be some selection issues associated with observing this subset of existing emails, we believe this network still gives us a “proxy” into the structure of communication and power in an important group of researchers (both at the individual and organization level). To build this network, we processed every email in the leaked data. Each email contains a sender and at least one recipient on the To:, Cc:, or Bcc: line. The key assumption is that every email from a sender to a recipient represents a relationship between them. Furthermore, we assume that more emails sent between two people, as a general proposition indicates a stronger relationship between individuals. To visualize the network, we draw a blue circle for every email address in the data set. The size of the blue circle represents how many emails they sent or received in the data set – bigger nodes thus sent or received a disproportionate number of emails. Next, we draw grey lines between these circles to represent that emails were sent between the two contacts. 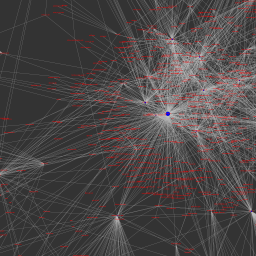 These lines are also sized by the number of emails sent between the two nodes. Typically, we would also provide full labels for nodes in a network. However, we decided to engage in partial “anonymization” for the email addresses of those in the data set. Thus, we have removed all information before the @ sign. For instance, an email such as johndoe@umich.edu is shown as umich.edu in the visual. If you would like to view this network without this partial “anonymization,” it is of course possible to download the data and run the source code provided below. Note: We have updated the image. Specifically, we substituted a grey background for the full black background in an effort to make the visual easier to read/interpret. Click here for a zoomable version of the visual on Microsoft Seadragon. In addition to the visual, we provide hub and authority scores for the nodes in the network. We provide names for these nodes but do not provide their email address. Hubs returns nearly identical ranks with slightly perturbed orders with the notable exception that the UK Met Office IPCC Working Group has the highest hub score. Thus, so far as these emails are a reasonable “proxy” for the true structure of this communication network, these are some of the most important individuals in the network. Unlike some existing CRU code, the code below is documented, handles errors, and is freely available. This article offers a very interesting insight into the structure of academic disciplines. Using a variety of sources, the authors collected nearly 1 billion interactions from scholarly web portals including Thomson Scientific, Elsevier, JSTOR, etc. Residing between Economics, Sociology and International Studies, notice the location for legal studies in the upper center portion of this screen print. The Full Size visualization as well as relevant analytics are available within the paper. 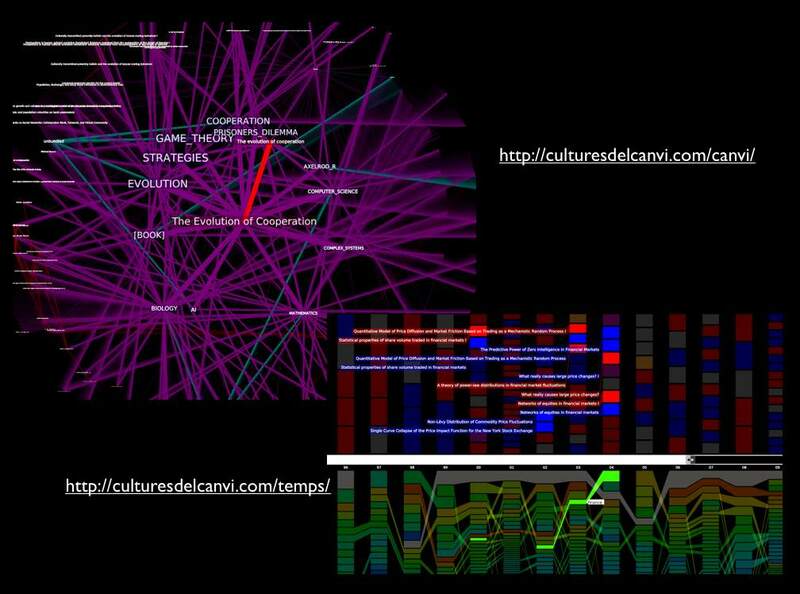 Among other things, the approach undertaken by Johan Bollen, Herbert Van de Sompel, Aric Hagberg, Luis Bettencourt, Ryan Chute, Marko A. Rodriguez & Lyudmila Balakireva provides an alternative view of the current structure of the academic disciplines from that offered in existing bibliometric studies. 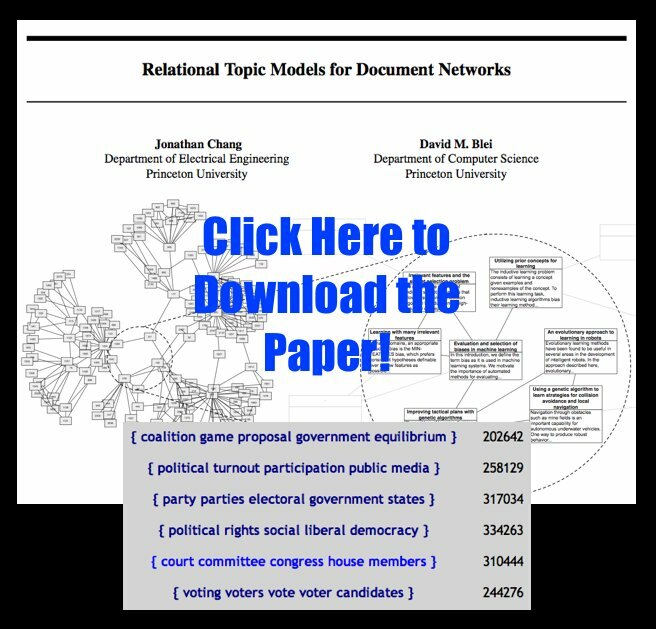 At the recent Networks in Political Science Conference (Harvard 2009), Ramiro Berardo from Arizona presented a paper entitled Networking Networkers: An Exploration of the Patterns of Collaboration among Attendees to the First Harvard Political Networks Conference. 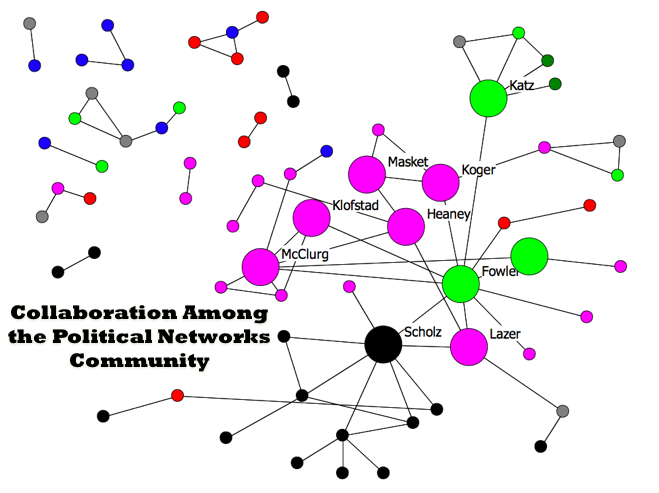 The above visual displays the patterns of collaboration among the growing networks community within Political Science. Major scholars in the field including James Fowler, John Scholz, David Lazar and Scott McClurg are displayed. In the northeast corner of the graph you can observe yours truly, Daniel Katz. At the rate he is going, it will not be long until there is a large and central Bommarito node on this graph. 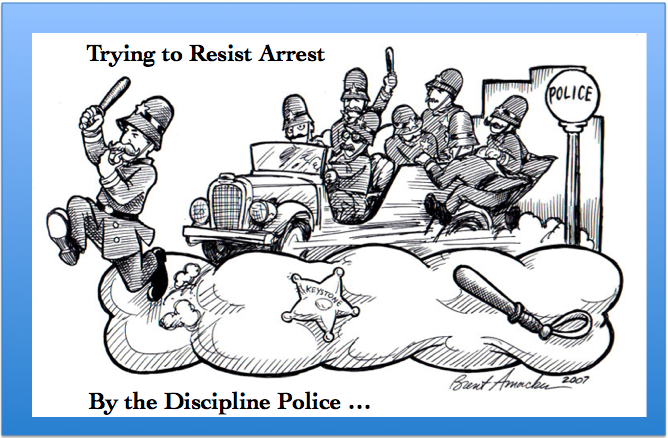 Perils of Interdisciplinary Scholarship — Evading the Discipline Police? In that vein, we wanted to offer some of our favorite recent papers drawn from a wide variety disciplines…. Jenna Bednar & Scott Page, Can Game(s) Theory Explain Culture? (The Emergence of Cultural Behavior Within Multiple Games), Rationality and Society, 19: 65-97 (2007). Riley Crane & Didier Sornette (2008) Robust Dynamic Classes Revealed by Measuring the Response Function of a Social System, Proc. Nat. Acad. Sci. 105: 15649-15653. Frans de Waal, Kristen Leimgruber & Amanda Greenberg (2008). Giving is Self-Rewarding for Monkeys. Proc. Nat. Acad. Sci. 105: 13685-13689. Author Daniel Martin KatzPosted on May 5, 2009 Tags structure of scienceLeave a comment on Perils of Interdisciplinary Scholarship — Evading the Discipline Police?